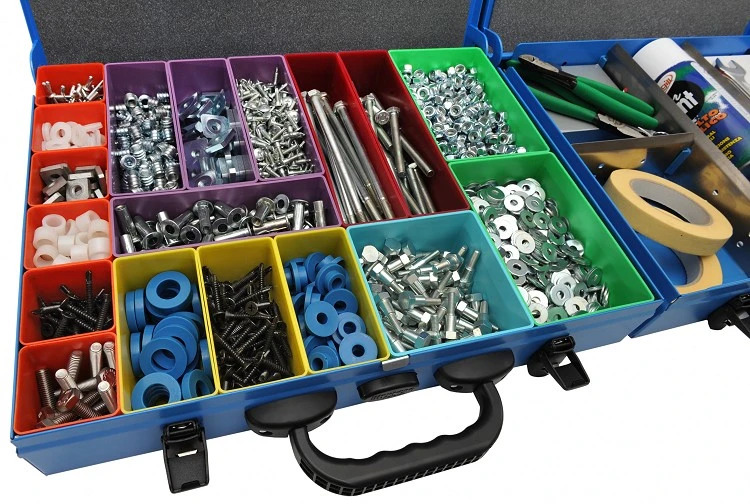 A WIDE RANGE OF METAL CASES FOR STORING TOOLS AND SMALL ITEMS. A sponge on the lid to avoid the various items getting mixed up. Automatic closure. 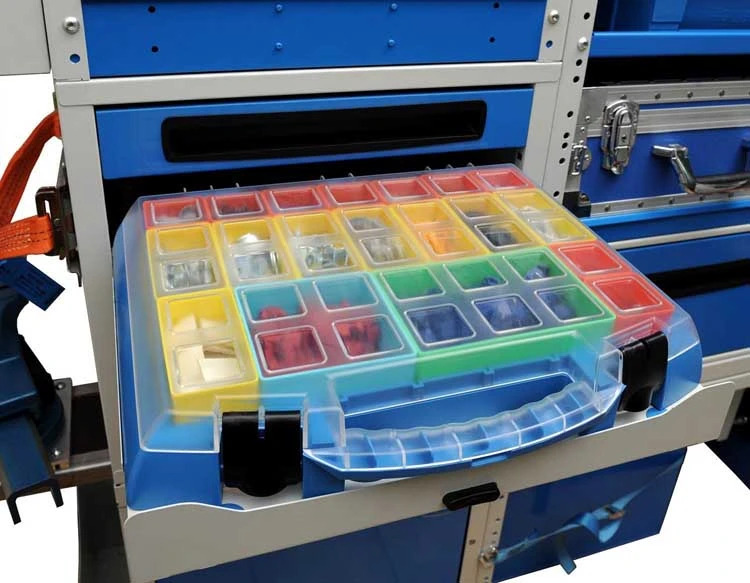 Just close the lid and your tool box is already closed! 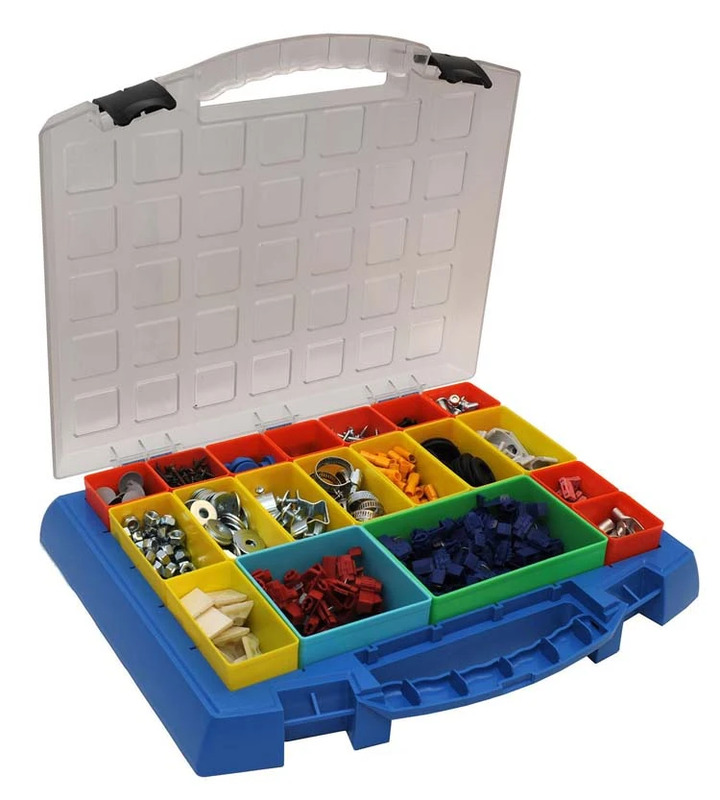 A wide range of plastic containers and metal dividers. 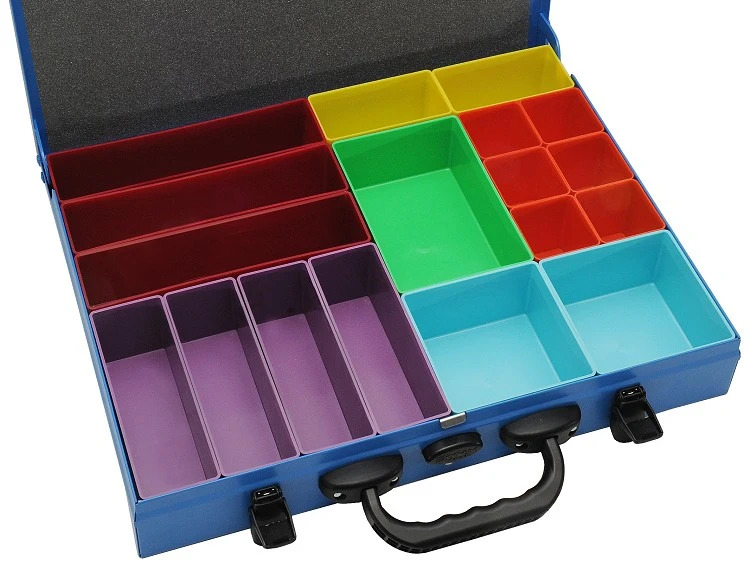 Can be stowed away in drawer units. The Galaxy line of portable utility cases is innovative for its fresh look, as well as its improved functionality. The entire family of Syncro cases is now fitted with hinges that hold the lid upright and prevent it from tipping backwards. 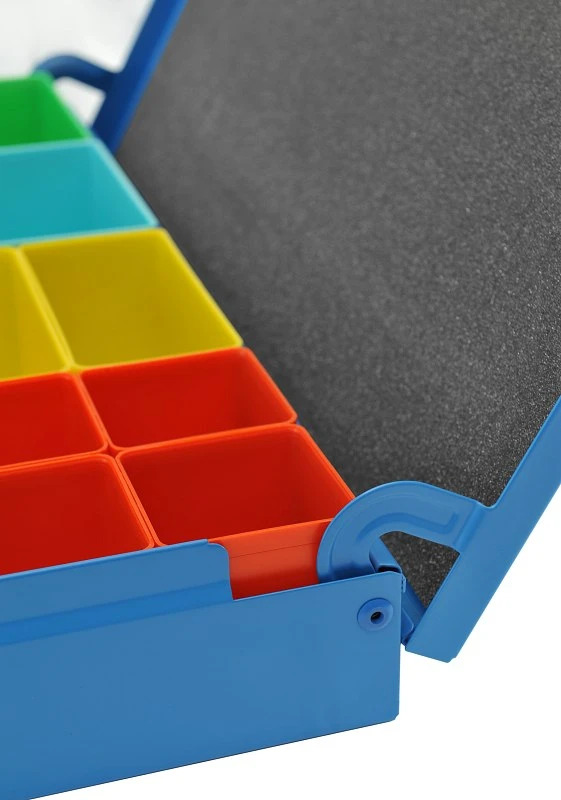 This not only gives the case a smaller footprint but also helps prevent damage to the lid. The 444x337 cases can be provided only with metal dividers. The photos show two cases, one of 66 mm and the other of 173 mm in height. ORION METAL CASE. Size 285x390x64 mm. Due to its reduced size this model is the only one without a sponge on the inside of the lid. 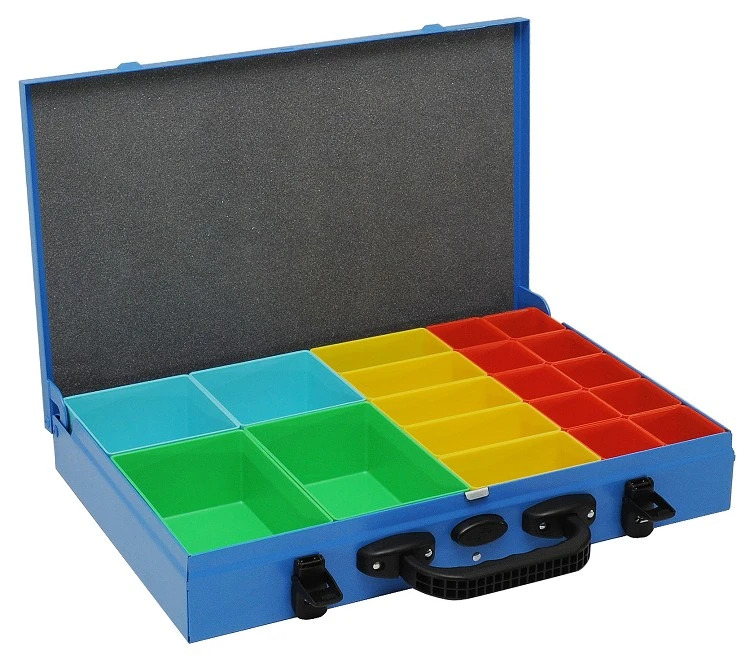 MINISYNCRO CASE Size 285x444x66 mm. Can be stowed in a drawer unit utilizing a special adapter. 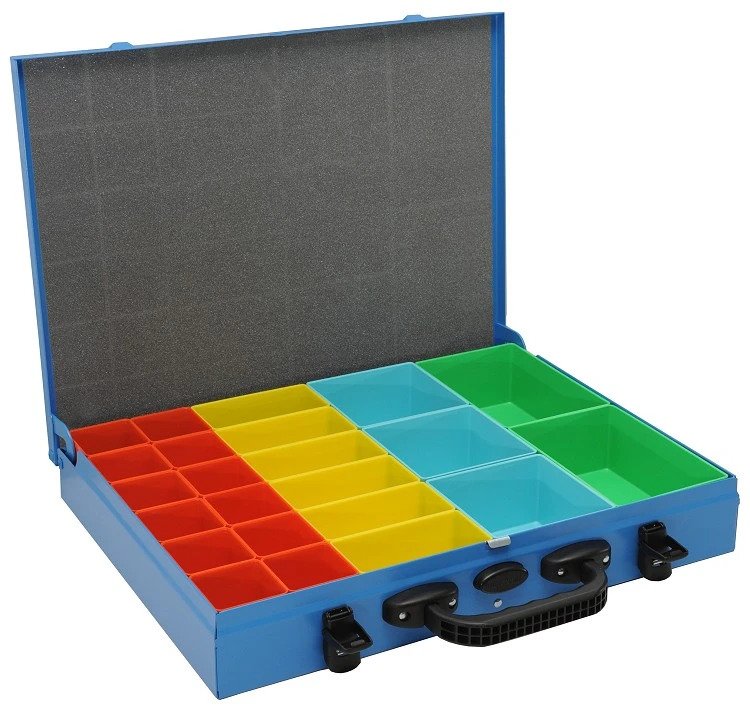 Tool box size 444x337x66 mm., 444x337x100 mm. and 444x337x130 mm. 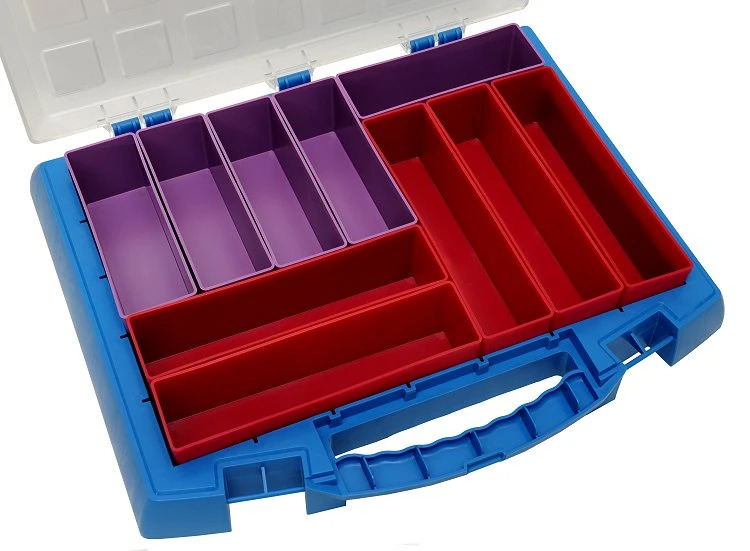 The Syncro portable organizer case family expands with two new sizes of removable mix&match mini bins: 162x63x54 mm 216x63x54 mm. 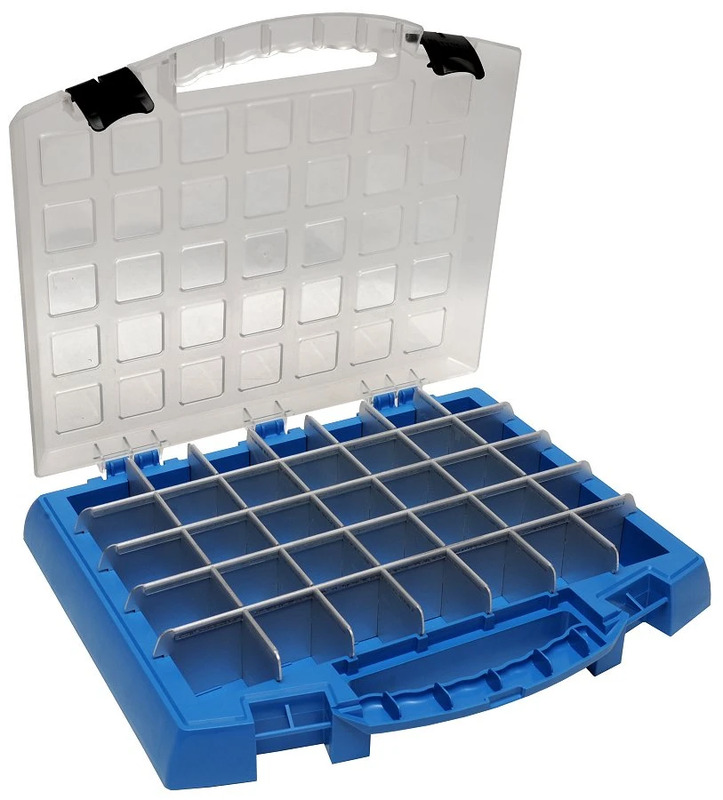 The catalog now offers nine different sized plastic bins: two with a height of 31 mm, and seven with a height of 63 mm. The new bins are 100% compatible with the existing bins. 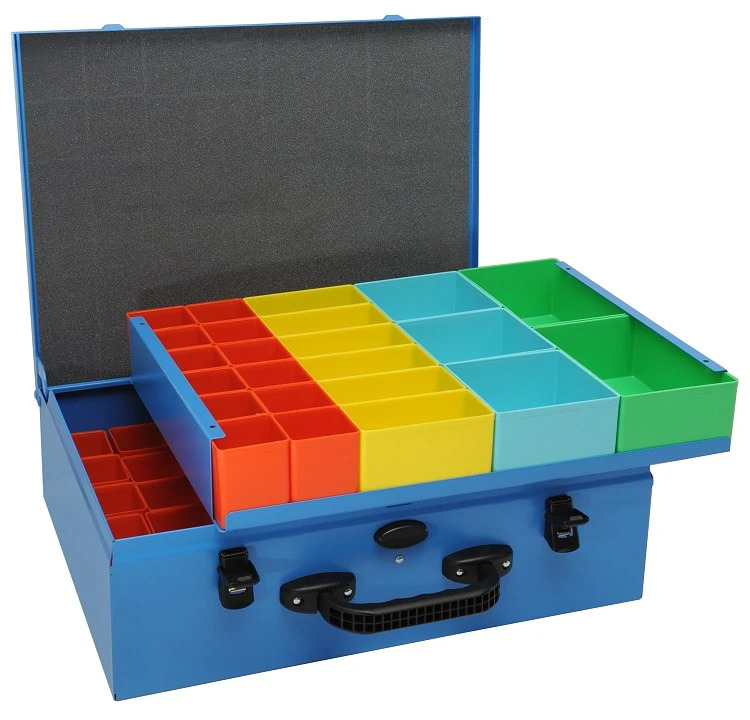 Here you can see some examples of cases with different combos of mix&match mini bins. 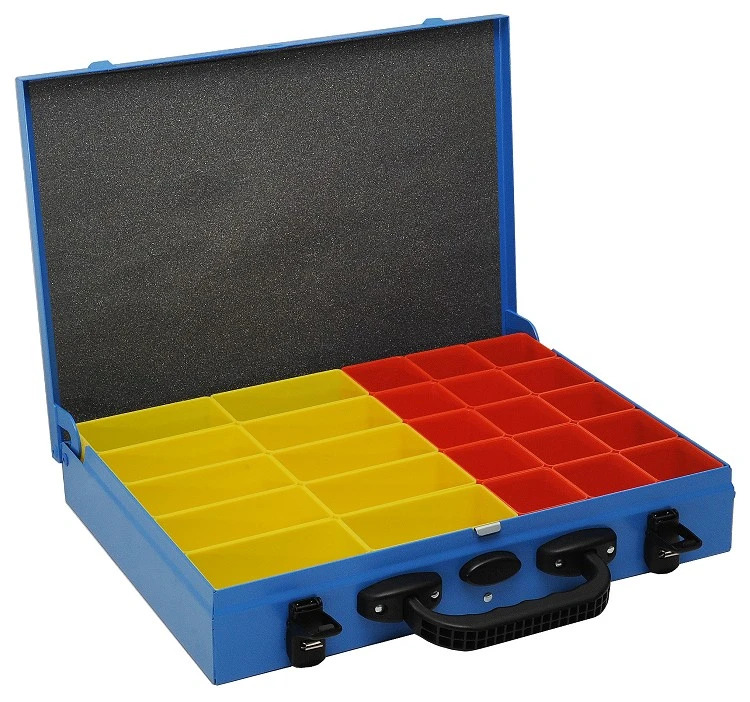 Are you looking for a professional portable utility case for your work? 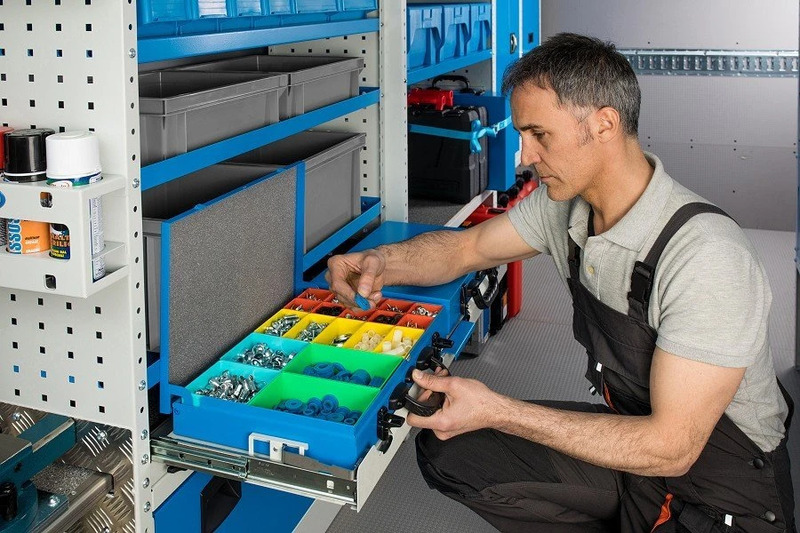 Do you want it to be polished-looking, lightweight, durable and just the right fit for the Syncro racking modules? 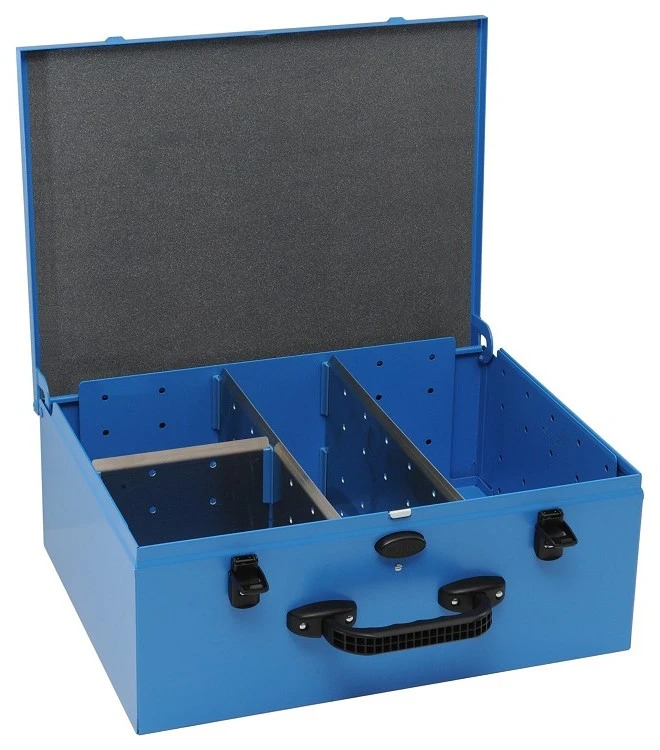 The portable Syncro utility case has an ABS electric-blue shell and anodized aluminum frame, complete with lock, key and steel hinges. 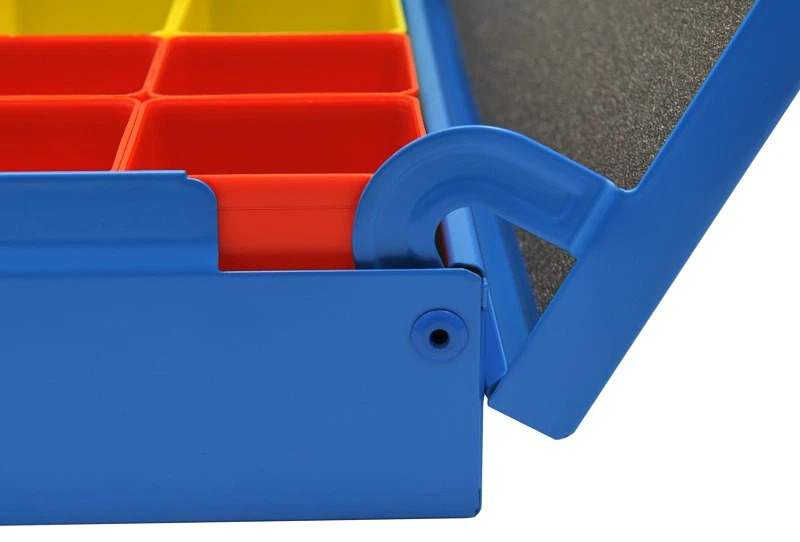 Interior pocket for documents, elastic pockets for tools, and three dividers on the bottom for organizing small parts and fittings. 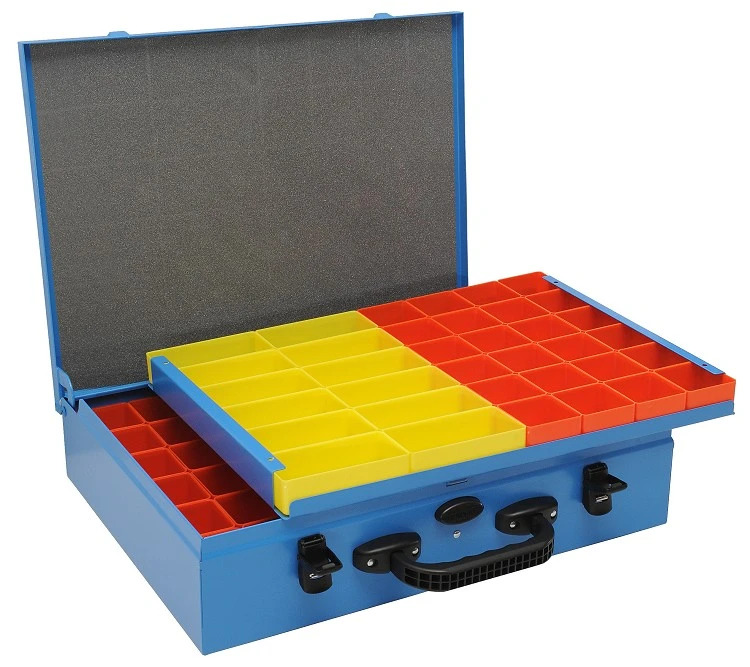 Dimensions of 444x337x173 mm permit easy insertion in Syncro System case cabinets. 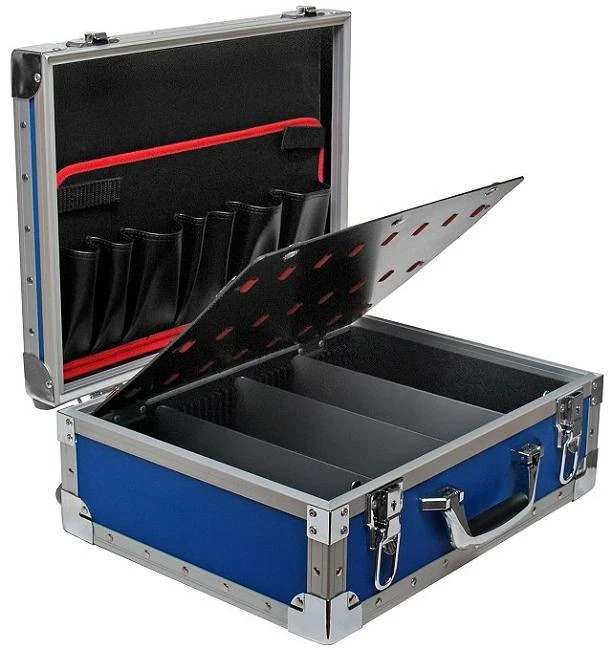 Heavy-duty metal cases in high strength steel, with double locking latches, durable plastic handle, and complete with foam inserts: eggcrate foam on the bottom and smooth foam sheeting under the lid. 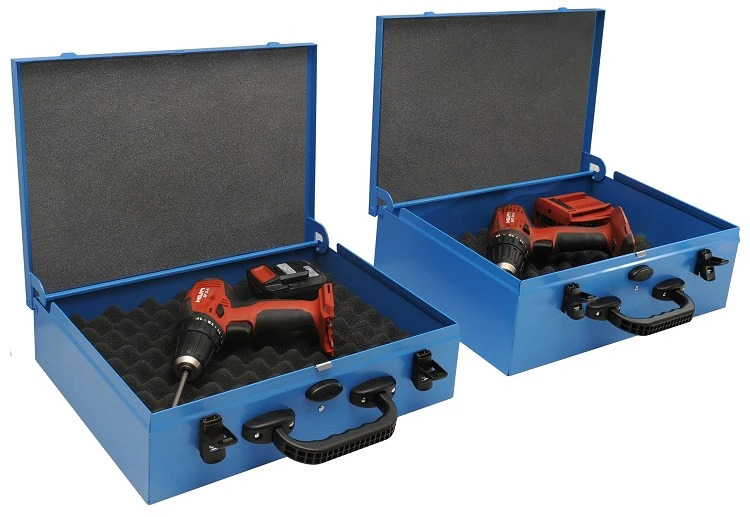 The DRILLO model (285x390x100h mm) per smaller drills and power tools. 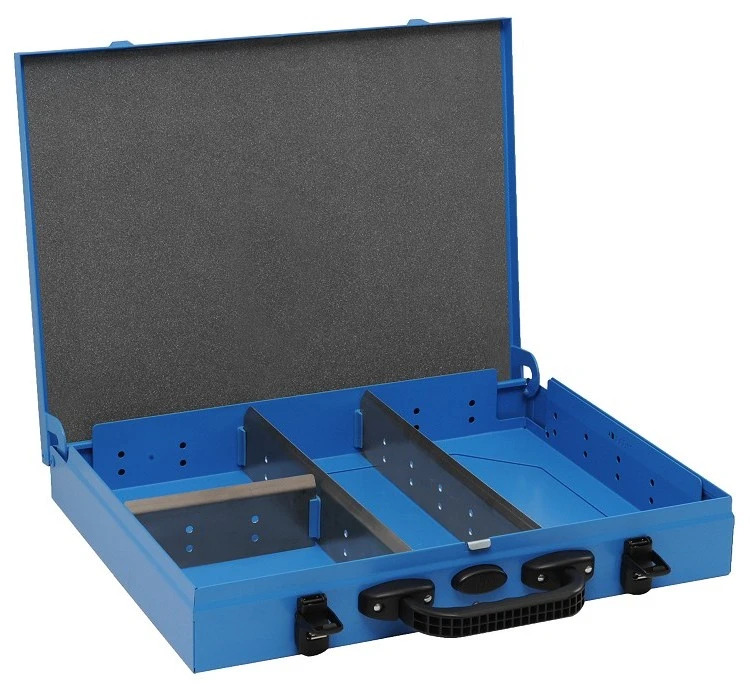 The MIDIDRILLO model (285x444x130h mm) for larger drills and grinders, saws, sanders, etc. 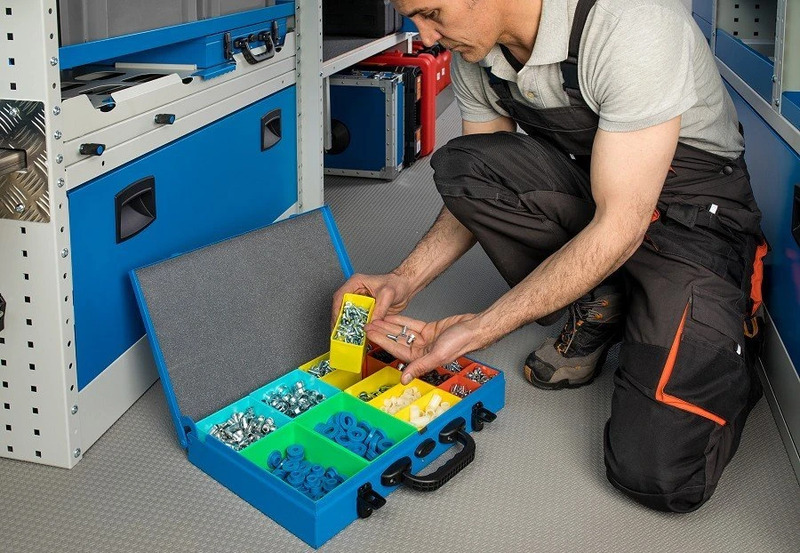 Lightweight, strong and safe small parts cases fof vans.